I’m an optimist, my husband is a pessimist. I’m too far one way and he’s too far the other – at times we balance each other out, yet at other times one of us can overwhelm the other. I love vintage, pre loved, recycled and don’t mind paying extra for something I love, whilst he prefers a very modern style and preferably new. Our music choices are different and whereas I enjoy eating pretty much anything he is very particular about what he wants to eat. I suppose if you’ve been reading my blog for a number of years you may have drawn a picture in your mind of the relationship we two share and believe my beloved and I are of similar nature, have similar likes and dislikes and always agree. But that’s not the case. From before our wedding we were challenged by God to walk in love with each other, to support and pray for each other, to put our spouse’s needs before our own, to surrender our battle line – and honestly, my husband was better than I at that for a while, but as the years rolled by those self-sacrificing choices and emotions and responses became part of our nature, ingrained and quite normal in this marriage of two very different people. Yet within our differences are some rather wonderful similarities that the Lord used to bring us together. They silenced the warnings from many family and fellow Christians who predicted our marriage would never last because we understood each other better than they did, and we knew God was using the similarities to knit our hearts closer. As infants we both lost our mothers, both had a negligible relationship with our fathers and both of us were raised by paternal grandparents. I am an only child and he was raised as an only child. Neither of us found making friends easy (to this day) and we both need a lot of alone time with our own thoughts and space to just be. Both of us love older people because we grew up with them and funnily enough we have many times rented a home next door to a widow whom we were able to help. These similarities have worked as glue to bind us together, but the strongest glue we share is our love for Jesus. I adore my man and he feels the same way about me. When he looks at me I see nothing but love and respect and honour in his eyes, and he sees this in my eyes for him. The closer we have walked with Christ, the longer we walk in His ways and accept correction and direction from His Word, the deeper our love grows and the more able we are to allow the other spouse to ‘be’ who God made them to be and not try to mold them into our own likeness. 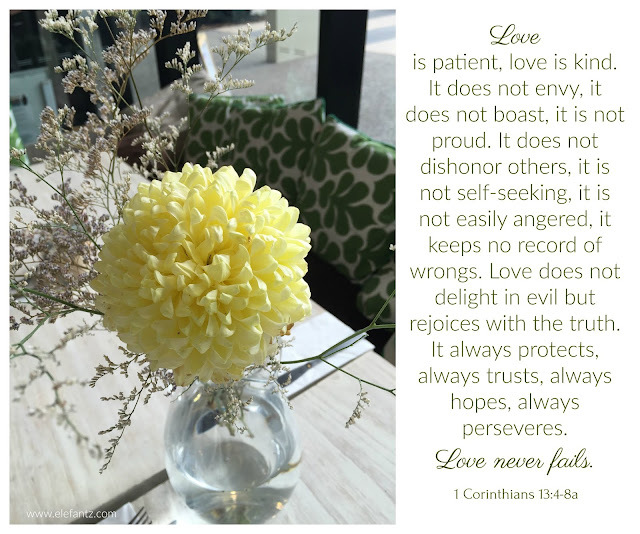 Sure it would be easy if our personalities were the same, but how would God grow us in those attitudes of love written in 1 Corinthians 13:4-8? I can’t tell you that I’m always kind or understanding with my man, but I can say I try every day to choose God’s heart over my own and when it’s difficult I have learned to shut my mouth and pray for a better attitude, Holy Spirit understanding and personal humility. And you know what, God always comes through. When I let go of me and put on Christ then within a little while my heart response is moved to love this man I married more than I love my view of a situation. Surrendering self truly is a daily grace God offers us, and the reward is peace that surpasses all understanding. Thank you for these reminders, of how even though we may be so very different from our spouse surrendering ourselves to God is always the right thing to do! You are always an inspiration . That Corinthians verse is my absolute favourite one Jenny & one day, I have promised myself to stitch it. When you wrote your first paragraph today, you may very well have been talking about my Mr & I ... it sounded so very familiar to me as if you were describing us! It's good to be reminded that love is self-sacrificing. To die to self daily for someone you love is not a burden when it's love. I'm grateful for daily grace from God to help me improve & grace from my husband when I don't. I was once told by someone that the pairing of my husband and I showed that God had a sense of humor. I am so grateful that I am loved and are able to love as God intended. I always cherish the good times and keep them in my heart when life becomes difficult. You are such an inspiration! Thanks for sharing!! Jenny, you have said so well what those of us who have been married for years have learned. Engaged couples could surely benefit from your wise words. Oh Jenny, Thank you for your words today. I have been with Jim now for forty years...we have been married for thirty eight. We had things in common yet quite a number that weren't. We have stuck it out and never let the D word come into our thinking. My parents were divorced and both of my grandmothers divorced TWICE. I was determined to stop that cycle. Besides Christ, Jim is my heart and soul. That is why this recent sickness with him has been so hard. The last time Jim had been in a hospital was when he was a teenager and he had a collapsed lung. I wasn't around then. Jim has always been the caregiver. I don't know if I could count the number of times I have been in the hospital. I have been making doctor appointments. Jim does all of that, even mine. Jim takes care of my prescriptions...orders them and puts them out for two week periods. Now I am doing that plus I am doing his and making sure he gets his at the proper time in his feeding tube. I am not saying that I mind for I would do anything for him, it's just a bit overwhelming. Maybe Abba felt I needed to grow up at the age of 60. Thank you for your posts. I look forward to my time reading them each day even though I don't have the time to always respond. Thank you so much for these beautiful words and Truths from God's Word. You are such an inspiration in so many ways. May our Father continue to bless you as share His love to others. I am used to my husband and I being very much in "cinque". That is why I get tested when he behaves or says things that I am not in line with. Comes from left field. Thank you for the reminder. If we married people just like us, where would the impetus for growth come from? My parents were married for almost 66 years when my mother passed...they were opposites in so much - pessimist vs. optimist, planner vs. go with the flow, early bird vs. night owl - but like you, Jesus was their center. I may have heard them argue twice whilst growing up. I would say my dad gave in much more than my mother, but that just may be my perception. My hubby is much more like my dad while I am definitely a mixture of my parents! Your post is dead on and I thank you for the reminder! That's really lovely, Jenny. One thing the marriage has done has draw both of you closer to Christ as you try to draw closer to each other. I love that plan! Thank you for your wise words Jenny. Beautiful post. I really needed to read this today. My husband and I have been married for 46 years and I sometimes let our differences get in the way. I have been absent this week from blog reading. A touch of "something". Not awful, just "meh"! Better this early Friday in the states morning. Your first paragraph spoke to me. My husband and I are so different too! I am more like you, he is more like Mr E. I call him Mr Beige, instead of mission brown...but similar. I am a people person, Mr. B not so much. Thanks for the little pep talk and the scripture reminder. Actually I Corinthians was used in our wedding ceremony, almost 54 years ago! Bless you! Thank you,Jenny. I'm speaking to some young married women next month and will share some of your thoughts with them. I am speaking to a MOPS (mothers of preschoolers) group in a few months. May I share your devotional with them?